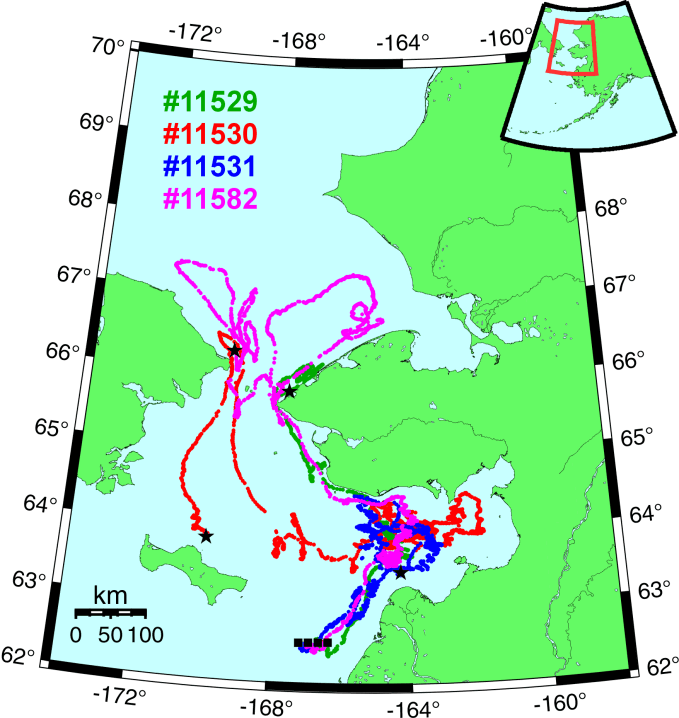 This webpage is presented by Steve Ignell of NOAA's Alaska Fisheries Science Center Auke Bay Laboratory and Tom Weingartner of UAF's Institute of Marine Science to provide near real-time access to the drifter tracks of four ARGOS drifters deployed off the mouth of the Yukon River on the Bering Sea shelf. The drifters are drogued at 10m depth and were deployed on August 4, 2001 by the USCG Icebreaker Polar Sea. Black boxes indicate the launch position and black stars indicate the location of the most recent good position fix. Drifter #11530 had a stuck position sensor for a number of days before successful transmission from Norton Sound. This page created and maintained by Seth Danielson. Last update 6/18/02. Please email with any comments, questions and suggestions.